I've been meaning to feature Zoe Hillyard's Ceramic Patchwork on Design Hunter for some time. Last week I'd planned to write about the the work she is currently exhibiting at Uppark House, a National Trust property in West Sussex, but somehow Clerkenwell Design Week and other events got in the way. Writing this post now, in the aftermath of the awful fire that ripped through Glasgow School of Art last week, the story behind Zoe's work seems to have a particular resonance. In 1989, Uppark House was devastated when a fire, which started on the roof, ended up gutting much of the house. As the fire burnt downwards, a desperate race began to remove artifacts, paintings, textiles and furniture from below. Chains of people passed precious items out onto the lawns. Eventually ceilings and fireplaces caved in, plasterwork and remaining items were smashed and all ground floor rooms were left exposed to the sky. When clean up and restoration operations began, the four foot of damp ash and debris which lay in the rooms was gathered up and stored, waiting to be carefully sorted, and a decision was made to restore Uppark to 'the day before the fire'. What then emerged was a vibrant community of skilled craftspeople, taking up residence in makeshift workshops and offices in the grounds of the property. Old skills were rekindled and expertise shared. Salvaged fragments were grafted onto replacement sections. Tides of people came and went and slowly Uppark was rebuilt. From the traumatic event came an opportunity for discovery and innovation and the collective energy of the endeavor left its mark on everyone involved. When Zoe was recently commissioned to create a body of work for an exhibition at Uppark alongside twelve other artists, she wanted to celebrate the painstaking dedication of this remarkable temporary community. Using traditional patchwork hand stitching techniques as a mending process to revive discarded and broken ceramics, her work plays on the aesthetics of architectural restoration and the tradition of Japanese ceramic mending, kintsugi. "I'm interested in the idea that things that are broken might actually be more beautiful as a result of it, rather than actually losing prestige or being devalued in some way," says Zoe. "There's something beautiful about the mending quality." For the Uppark commission, she began by spending a day at the house rummaging through crates containing fragments from the fire, singling out and photographing those that had interesting fire damage or visual pattern. "There's a whole room full of storage crates containing fragments of pieces salvaged from the fire. Each one is meticulously grouped back into the item it came from, but they are so smashed and beyond repair that they are never going to be put back together," Zoe explained. "They can't be thrown away because they are an important part of Uppark's heritage, but neither are they ever going to be reconstructed and placed back in the house, so they are in limbo. What I wanted to do was make at least one piece that brought those things back into life, almost like the idea of reincarnation." Above: Photography, digital fabric printing and hand-stitched construction has enabled some of the fragments to once again take on three-dimensional form and return to sit, if still incomplete, within the elegance of the Red Drawing Room. Other pieces in the collection are stitched from a mixture of fabrics, both old and new, some gathered on what Zoe describes as her own 'Grand Tour' of charity shops and vintage sales, others digitally printed with repurposed classical and oriental imagery, referencing the family history of Uppark's owners and their links with the East India Company and oriental trade routes. 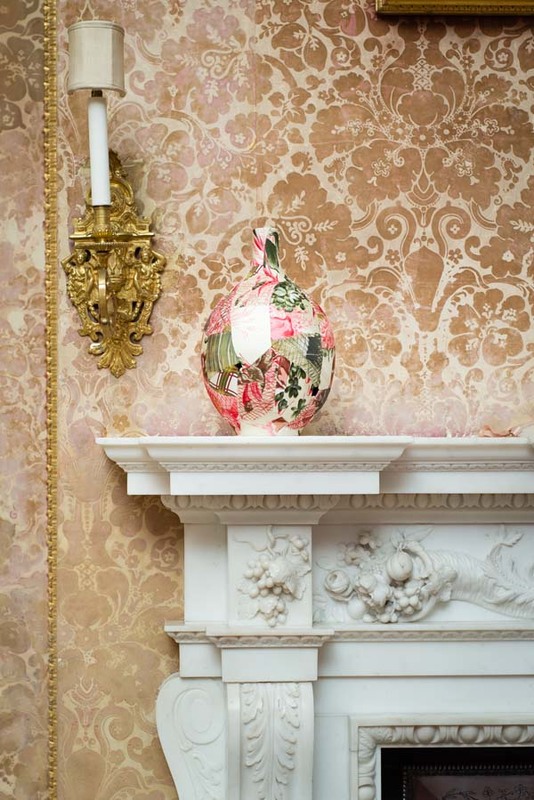 Above: Zoe's ceramic patchwork pieces sit in the Red Drawing Room at Uppark as 'replacements', alongside 'fire survivors' and substitute ceramics. "What’s quite amazing about Uppark is how completely devastated it was in the fire," says Zoe. "It’s such a feat what they’ve managed to do in putting it back as it was and rekindling the atmosphere that the place has." A remarkable outcome indeed, and one that those involved in beginning the process of restoring the Mackintosh building in Glasgow, may perhaps be able to draw some comfort from. Unravelling Uppark, featuring the work of thirteen artists specially commissioned to respond to moments and events in the history of the house, is at Uppark House in West Sussex until November 2nd. Images of the Red Drawing Room at Uppark are by Jim Stephenson. Ceramic fragment images courtesy of Zoe Hillyard.